Feel like youâve escaped it all with this light filled Victorian farmhouse-style estate & guest house on a gated, private 2.5 ac property. 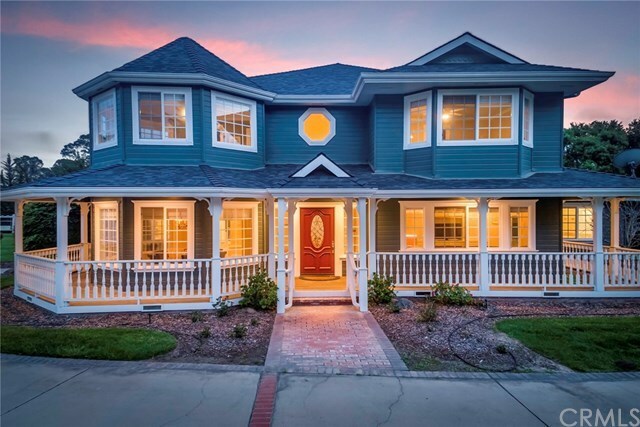 Situated just a few minutes from The Village of Arroyo Grande, this gorgeous home features 4 bed/2.5 bath, gourmet kitchen, den/office & main level master suite. Guest house above garage offers 1 bed/1 bath, living room & kitchen. Live the quintessential California lifestyle, just minutes from sandy beaches, award-winning wineries & charming small towns. Bask in sun-drenched rooms with large windows & cathedral-vaulted ceilings. Spacious & bright living room with gas fireplace, built-ins & French doors to the wrap-around deck & outdoor kitchen. Expansive kitchen offers ThermadorÂ® appliances, island, breakfast bar & walk-in pantry. Additional spaces include den/office & separate formal/informal dining rooms. Privately situated main floor master suite features luxurious master bath with walk-in shower & jetted tub with views. Enjoy the Mediterranean climate from the wrap-around deck, fireplace & outdoor kitchen with gas grill & Santa Maria-style BBQ pit. Grounds feature expansive manicured lawn/landscaping, mature avocado/fruit trees, garden beds, 3-car garage, lighted batting cage, playground, water storage tanks & solar panels providing all electricity. Property located just 5 mins from the Village of AG, 10 mins from Pismo Beach & 15 mins from San Luis Obispo & airport. Experience this private estate & its tranquil ambiance for yourself. Directions: Take Noyes to La Teena, Left on Karina Way. Property is at end of cul de sac. Call office for gate code.